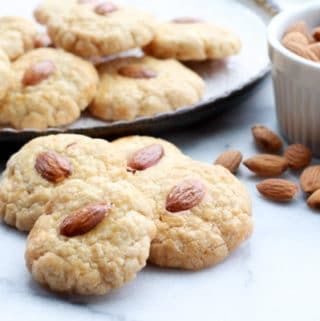 Last Updated: April 15, 2019 · Published: February 11, 2019 By: Asian Caucasian 12 Comments This post may contain affiliate links or sponsored content. 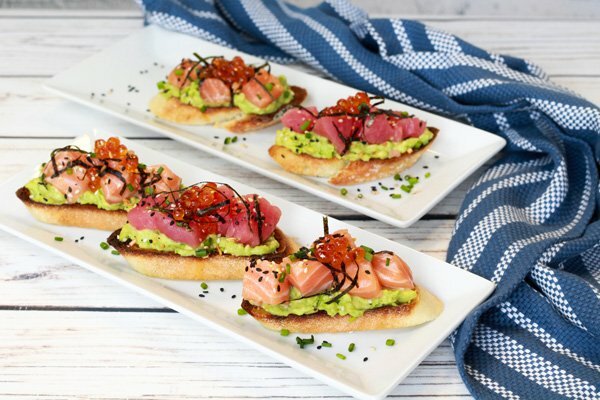 These beautiful Sushi Avocado Toasts are almost too pretty to eat! 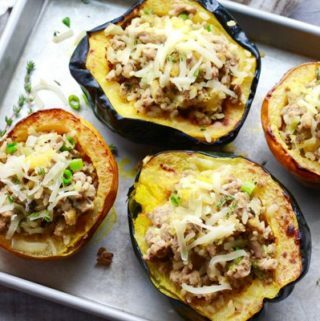 Any way you layer them you can’t go wrong with the presentation and flavor! 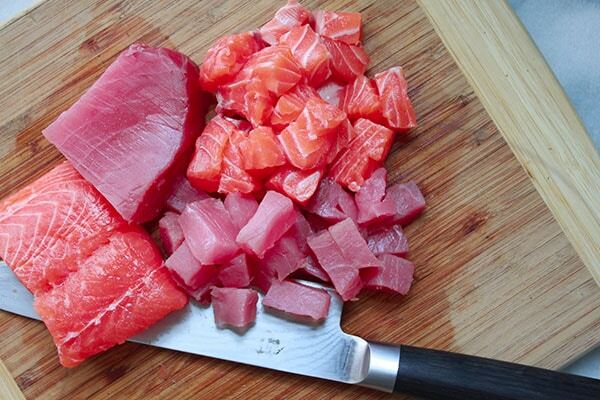 Cut the sushi-grade tuna and salmon into small, even cubes. Next, mash the avocados in a small bowl. Set both aside. Slice the bread into 1/4 -inch slices and spread on a baking dish. Brush each slice with the avocado oil (or olive oil) and toast in the oven until golden brown. 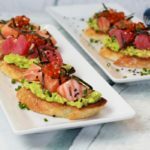 Beautiful cubes of sushi-grade salmon and tuna are the star of this Sushi Avocado Toast appetizer! 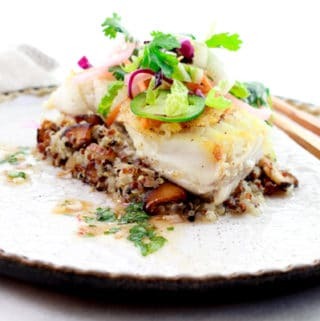 Try Whole Foods, Fresh Market, or your local Asian market for the freshest sushi-grade fish. 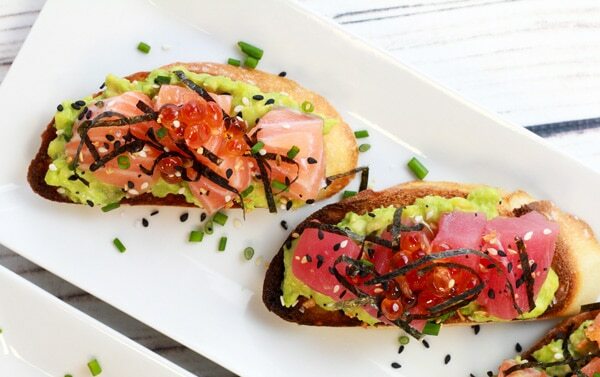 I used just-ripe avocados to mash for these Sushi Avocado Toasts. Don’t mash until you’re ready to assemble, or squeeze some lime juice on top so they won’t get brown! A fresh loaf of French bread or brioche will do just fine in this recipe. Even sour dough will work! Toast the slices until golden brown. 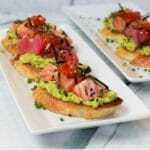 Spread about a tablespoon of avocado mash onto each slice of toasted bread. Then put a layer of the tuna and salmon on top of the avocado mash. Sprinkle with everything bagel seasoning and top with a dollop of the salmon roe. 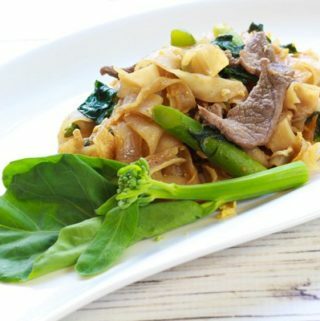 Garnish with chopped green onions or chives, and nori (seaweed) strips. I love Trader Joe’s Everything Bagel Seasoning! It works so well in this appetizer with just the right amount of salt. 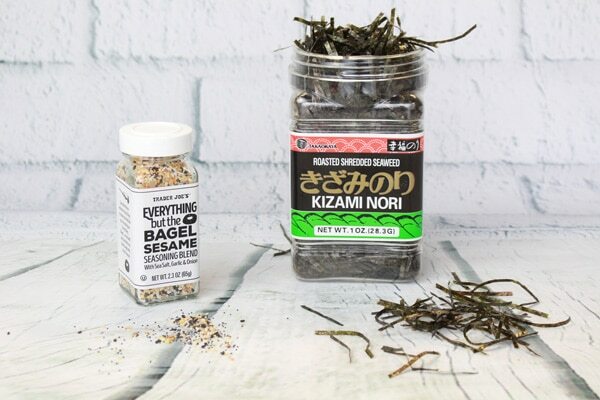 If you can’t find nori (seaweed) strips at your local grocery store, try your Asian market or Amazon. 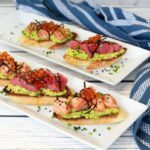 I can guarantee you that your dinner guests will be discussing this gorgeous Sushi Avocado Toasts appetizer over the water cooler for days! I purchase my sushi-grade salmon and tuna at Whole Foods, Fresh Market, or my local Asian market. I used French bread for this recipe but choose whatever bread you’d like. Brioche, or sour dough will work just as well! WANT MORE? If you like this recipe, you’re going to love my Sushi Tacos with Salmon and Tuna! Sushi-grade salmon and tuna is nestled inside a taco nori shell and topped with a spicy aioli — so yummy! 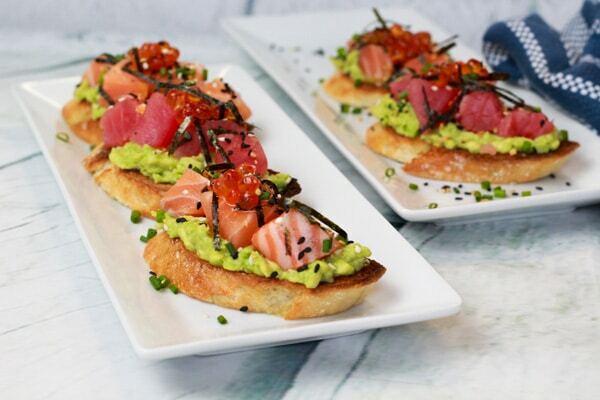 Sushi grade salmon and tuna are nestled on top of mashed avocado and slices of toast, garnished with seaweed strips and salmon roe! 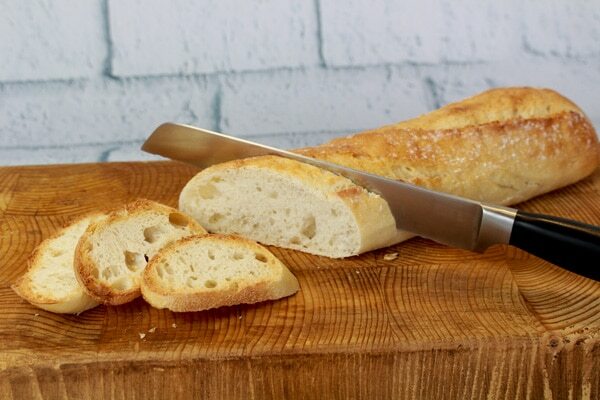 Slice the bread into 1/4 -inch slices and spread on a baking dish. Brush each slice with the avocado oil. Toast in the oven until golden brown. 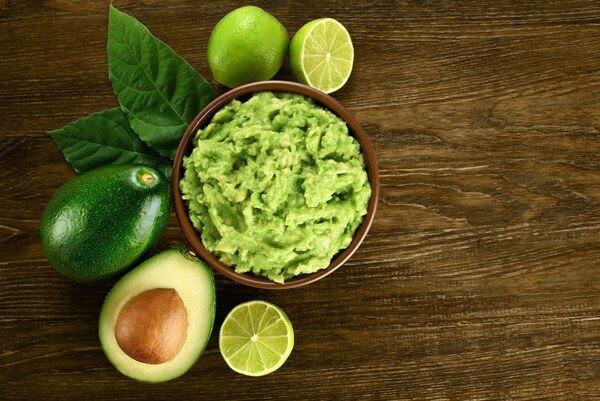 To assemble: Spread about a tablespoon of avocado mash onto each slice of toasted bread. Then put a layer of the tuna and salmon on top of the avocado mash. Sprinkle with bagel seasoning and top with a dollop of the salmon roe. Garnish with green onion and nori strips. If you can’t find sushi-grade tuna for this recipe, you can always use smoked fish like salmon or white fish. 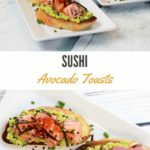 Although you won’t be able to call it Sushi Avocado Toasts! Make sure your avocados are ripe, but not overripe. You really don’t want to use a mushy squishy avocado! It’s SO easy! They will be very impressed with you, don’t tell them how easy it is to make! This is such a fun idea, and so easy to make too – would look great to serve guests as well. Delicious to the max! 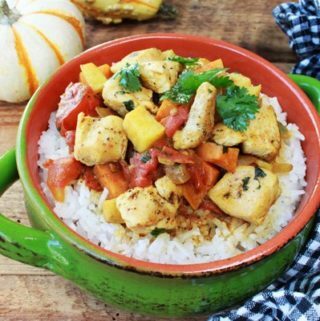 This is exactly the kind of recipe we adore in my home, I can’t wait to make it! 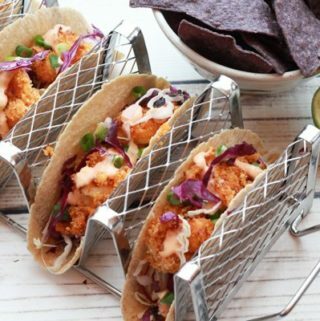 You’re going to love how easy this is to make! And it tastes amazing. My hubby went nuts over this one! What a beautiful presentation! I love tuna and salmon… need to pick up the seasoning at TJ’s. Can’t wait to serve this at my next get-together! I hope you and your party guests love this as much as we did. It’s really to-die-for! Thank you, Susan! Solution: Use smoked salmon on top, or crab, or shrimp. I’m sure it would be just as good!! Oh My! This is a mush make ASAP – my kids will go crazy about it too – what a great idea for parties but not only – we love, love sushi. Brilliant! Thanks, Ramona! It’s really fun and delicious. 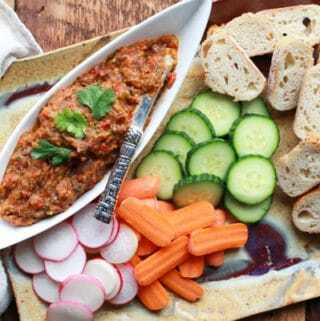 My hubby went absolutely nuts over this appetizer! I can’t wait for you to try this one, Sandy! My hubby went nuts over this appetizer. 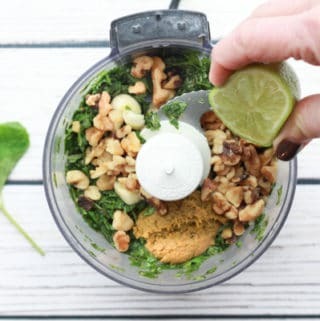 It’s so easy and incredibly tasty! I love avocado toast and sushi combined. YUM! OMG! 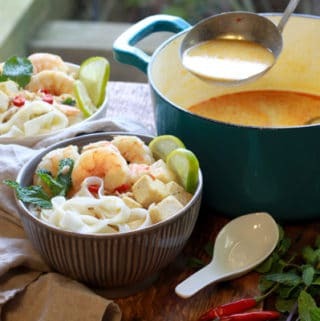 I am going to make this recipe this weekend for my party guests! They are going to love it! It’s such a pretty appetizer and I’m sure it tastes amazing!